View More In Knives & Tools - Page 2. Whether you're looking for an inexpensive groomsman's gift, stocking stuffers for those near and dear, or a personal defense knife to protect a friend or family member, this fully warrantied stainless steel knife will serve you well. 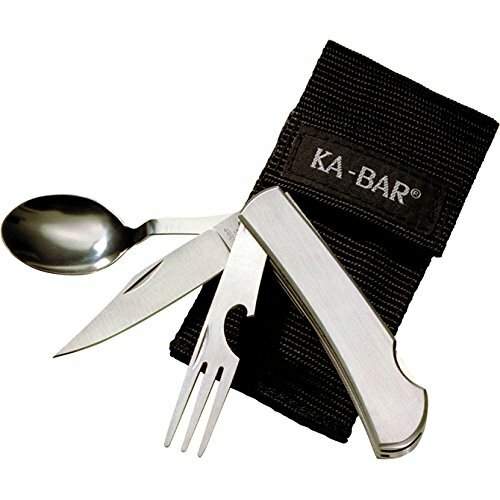 The Kabar Original Hobo knife includes a fork, knife and spoon with nylon carrying case. This utensil kit is perfect for on-the-go or outdoor dining. All three utensils slide apart and back together for an all-in-one dining kit. It is made of 420J2 Stainless Steel. The blade length is 3" and the open length is 6-5/8". Blade length: 3"; Open length: 6-5/8"